Yes, the fish is certainly fresh at this place; it's true, you can't find it any fresher anywhere - period, end of conversation. We know because the owners, Rob and Denise, probably just pulled it out of the Pacific Ocean on their boat, which is moored in nearby Charleston. 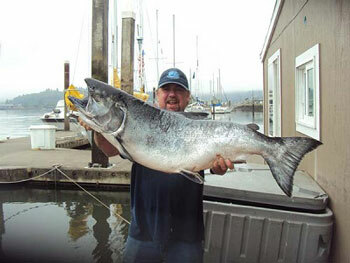 In fact, Rob formed West Coast Clams in 2011 "to bring to the market the only wild caught and locally harvested clam that the west coast has seen in over 20 years! One by one the clams are dive harvested and fully purged in approved water before going to the market! These clams can be sold as sashimi grade." Now, that's fresh! Is there really dim sum nirvana in Portland? We looked for a long time for one, having been utterly spoiled in San Francisco's Chinatown. Then we discovered - quite by accident - Ocean City Seafood Restaurant, on S.E. 82nd. And we now believe that Portland has its own dim sum nirvana, to thoroughly mix our metaphors. 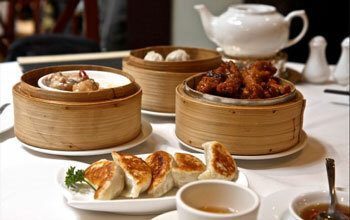 Within minutes of entering the restaurant, carts rich with an assortment of delicious morsels of savory food appear. Our table is quickly loaded with a selection of small steamer baskets and plates, and instantly we’re transported to a transcendent state of ecstasy via these gastronomic delights. Our Recipe Contest never ceases to amaze us with the variety and creativity of the entries, and this year was no exception. 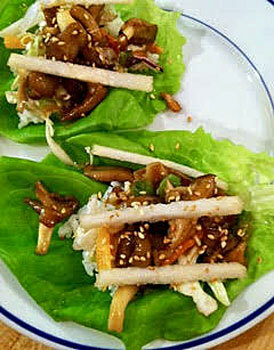 However, Lisa Key's Korean Mushroom Lettuce Wraps was a surefire standout. It quickly grabbed the judges' attention for its use of potent seasonings and striking colors. These pretty little packets are plump with the flavors of Asia, yet are made with ease. In spite of the exotic sounding ingredients, we believe that many everyday American cooks will have them in their pantry or refrigerator. The wraps, with their salty, sweet, sour and spicy tones, pleased the judges' taste buds and prompted us to comment that serving them as an appetizer would certainly prompt conversation and conviviality among diners. Lisa's wraps are bursting with flavor and color.